Discussion in 'xLights (Nutcracker)' started by smeighan, Aug 9, 2012. You may think i dont read the "What would you like to see in Nutcracker?". Steve Gase requested the ability to fade in and out the nutcracker effects last April 25th. Well Steve, you got it. 0 seconds disables the fades. You will see when i add new values onto an effect your current effects will have these prompts, but they will be blank. A blank also disables fades so your effects will work as they did before. Note the animated gif does NOT reflect your fades. To save disk space, i only show one rotation of an effect and let it repeat in the gif. Your sequences might have 5-10 of these rotations pasted together. In summary: Fades will not show on the animated gif's even though they are present. 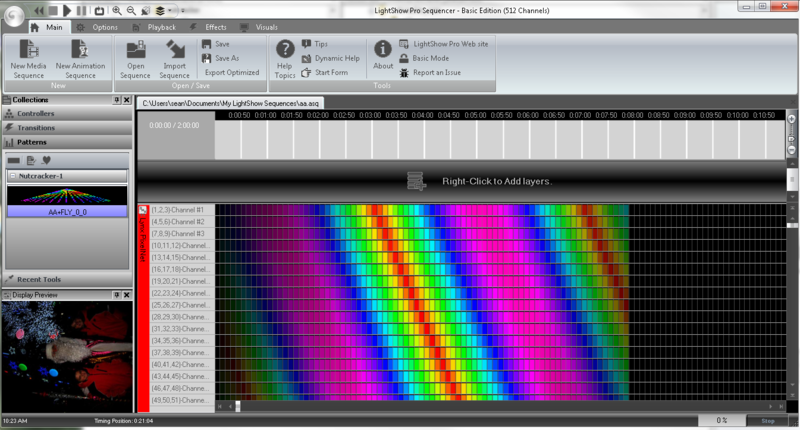 Try pasting the effect into your sequencer (I am using lsp), the fades appear there as expected. This required a change to every effect class and to the large library of code. i have tested lms, vixen and lsp.. let me know if you see any issues. Again Sean you are really making these effects so easy for so many people across many different sofware platforms, Thanks once again. Im looking forward to seeing how people use these effects in their displays this year. Thanks. i get very little feedback from anyone saying they are using nutcracker. So either no one is using it very much or they are using and it works without problems. I have no open bugs on the effects which make sme nervous, i know i have some. Here some i know and will work on. All effects: I was not handling the last end of a seq duration. If i had an effect that cycled every 5 seconds and you asked for a 27 second duration, you got 25 seconds instead. I fixed this yesterday. I think a lot of people are trying to work out how nutcracker effects will work within their whole sequence. Obviously it will help them do small animations for one part of the display (eg matrix or mega tree), they then need to try and work out how this ties in with the other elements. I think everyone is impressed with what you've done, it's just that most people are working out how they can use it! ps - did you ever get a chance to play around with that issue on the butterfly effect where there was a purple diagonal line that didn't seem to change? For my Christmas show i will sequence an entire song in Nutcracker, all 3 minutes of it. I have started coding Nutcracker 2.0. I hope i have something to show in the next 1-2 weeks. I have finished marking two TSO songs (Wizards in Winter and a Mad Russians Christmas). Here is the label export that has my phrases marked to within one microsecond from audacity. I will prompt for this music object file in a form. I will then create a form where for each phrase you give me the nutcracker effect you want. I will create the effect exactly the length of the phrase. I will allow any single phrase to be created or i will batch create the whole song. With something like wizards.phrase1, wizards.phrase2 as the output files. When using Nutcracker 2.0 you will never give a seq_duration, you just put an effect to a phrase. I have not had a chance to look into the butterfly band. it doesnt always show up, depends on the radian value you pick , it seems. i also need to work on spirals, one pixel each rotation is in the wrong place. I'm still into my hardware. I plan to use Nutcracker but won't know anything till Oct. or Nov. about how it works for me. I feel fairly safe as others have already done a half mega tree. And arches are easy to sequence if the single string feature gives me trouble. I'm still in the process of getting my visualization in LOR together. I have gotten a few effects worked out and should start sequence work in the next week or two. I have noticed something strange with the snowflake effect, but I'm not sure it's the software or me with the problem. i havent looked at the snowflake class for months. i am sure there are still some issues with it.